Bauble is designed to be simple, elegant and intuitive. Bauble is free. Bauble is licensed under the GPL which means you can download, distribute and change the source code for Bauble as long as the changes you make are also licensed under the GPL. This in no way affects the data you manage with Bauble. Bauble is cross-platform. Bauble supports both Linux and Windows and could easily be ported to other platforms if there was interest. Bauble can use different database backends and is tested against SQLite and PostgreSQL. 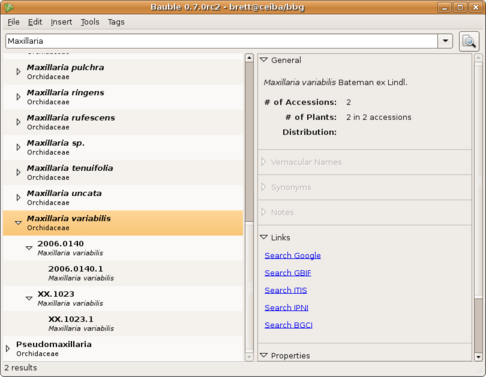 Bauble can generate reports through an XSL formatter backend. There is no fancy report designer but there is an interface that allows you to pass the results of a search through an XSL formatter. This allows you to layout your data any way you wish and save it in a just about any format you can imagine including PDF, XML, or HTML. Hopefully we’ll get something a but more user(i.e. non-techy) friendly in the future. Bauble can export data in CSV or Access to Biological Collection Data (ABCD) format. In the future we hope to support other standard formats such as DarwinCore, ITF2, BioCASE, TAPIR, etc. Bauble supports tagging. You can tag any arbitrary data stored in a Bauble managed database with arbitrary names. This way you can create collections of records organized the way you want with names you give them.